A mockbuster is a film, often made with a low budget, created with the apparent intention of piggy-backing on the publicity of a major film with a similar title. 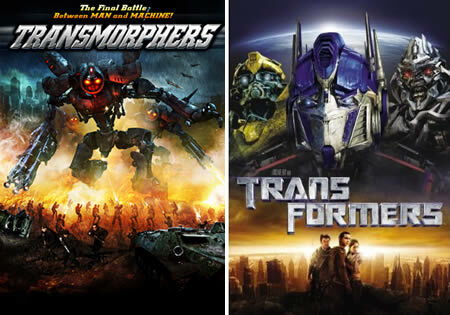 These movies have similar names like "Snakes on a Train" --not to be confused with "Snakes on a Plane"-- or "Transmorphers", instead of "Transformers." They are sometimes released around the same time real larger-budget movies, to make money off their hype and advertising. 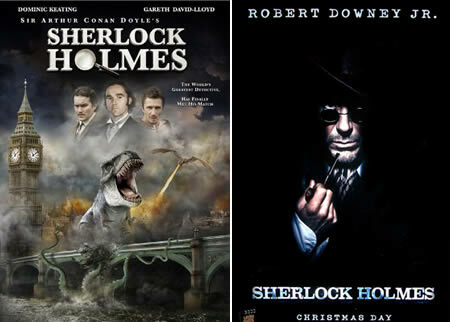 Be careful while ordering Guy Ritchie's latest blockbuster, Sherlock Holmes, starring Robert Downey Jr; you could end up renting its mockbuster rival edition of the same name, created by The Asylum. While deviating greatly from the plot of Transformers– its 'inspiration', Transmorphers contains plotlines similar to the films Blade Runner, The Matrix, The Terminator and X-Men. There is even a sequel, launched coincidentally by the same time as Revenge of the Fallen. This one almost got me! Its title is so similar to The Day the Earth Stood Still that The Asylum has been threatened with legal action by 20th Century Fox. 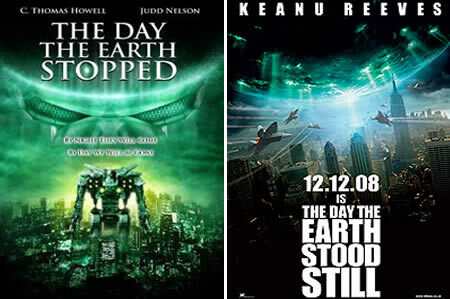 The film's plot of The Day the Earth Stopped also incorporates elements from other science-fiction films, particularly Independence Day and Earth vs. the Flying Saucers. 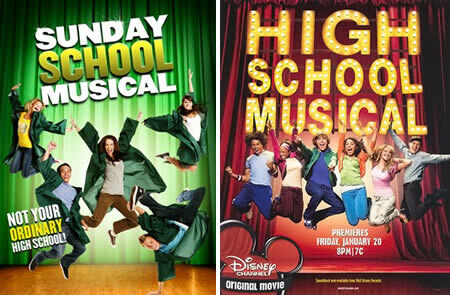 While similar to Disney's High School Musical franchise, the film takes a dramatically different approach in terms of storyline. It's like a Christian version of the first movie. In Sunday School Musical two competing groups of high school students must rally together and enter a song and dance competition in order to save their local church from closing. While at the same time trying to conceal their homosexual tendencies from getting out of control. 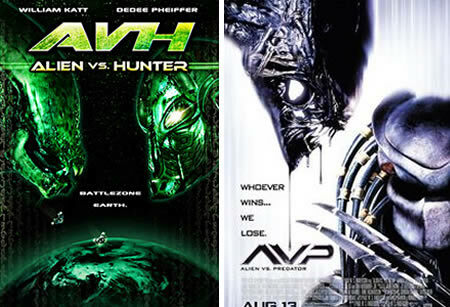 AvH, Alien vs Hunter , has a number of similarities to the Alien vs. Predator films. This includes its title (including the fact that Hunter and Predator mean the same thing) and the general premise. The design of the Alien is a reminiscent of H.R. Giger's design for the creature made famous in the Alien series, though it mostly resembles a giant spider. 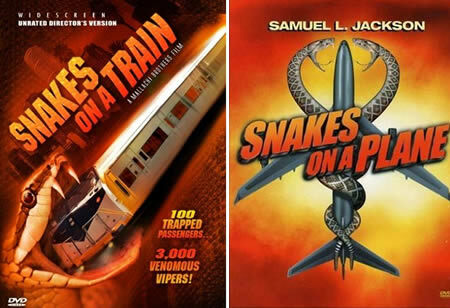 In case the title hasn't already tipped you off, Snakes on a Train is inspired by the film Snakes on a Plane which coincidentally was scheduled for theatrical release three days later. Although taking the same basic idea from Snakes on a Plane (lots of deadly snakes loose on a claustrophobic, high speed means of transport), the background story of how and why the snakes are there is significantly different. Under a powerful Mayan curse, snakes are hatched inside a young woman, slowly devouring her from within. With only hours to live, she jumps on a train headed for Los Angeles. Unfortunately for the passengers aboard, they are now trapped, soon to be victims of these flesh-eating vipers. While the box promises "100 Trapped Passengers - 3,000 Venomous Vipers", in reality there are only about a dozen passengers and a handful of snake. The Da Vinci Treasure is a 2006 mystery film that shares its title and several of its plot elements with the The Da Vinci Code by Dan Brown. 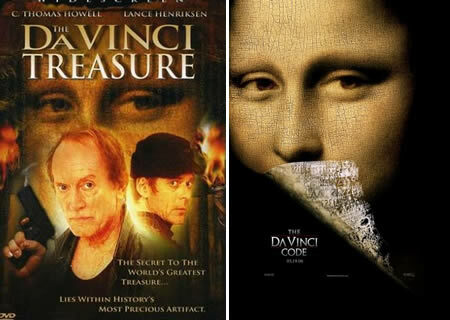 If you wonder if it's worth seeing it some reviews say “The Da Vinci Treasure is an awful, horrible, badly made attempted rip-off of a film”, or, “Why was this made? This is the worst copy-film I have ever seen”. 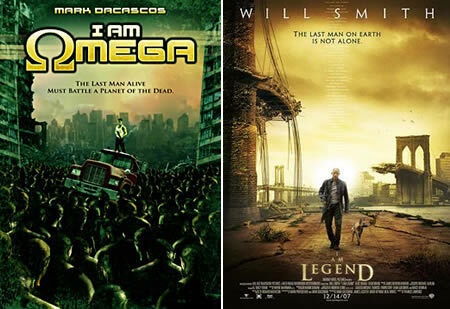 I Am Omega is an unofficial adaptation of the novel I Am Legend by Richard Matheson, the title being a portmanteau of The Omega Man and 2007's I am Legend with Will Smith, two other film adaptations of the same novel. The disaster film was specifically released to capitalize on Smith's big-budget film. Maybe the biggest hit from Asylum, H. G. Wells' War of the Worlds (also going by the title of Invasion and H.G. 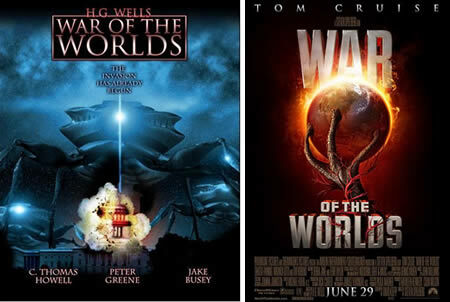 Wells' The Worlds in War) is one of three film adaptations of The War of the Worlds novel released in 2005. Unlike most adaptations, The Asylum intended to make this War of the Worlds film more of a horror film. It was rated R for strong violence/gore, language and moderate sexual content. Director David Michael Latt describes the film as The Pianist with aliens instead of Nazis, comparing the tale of one man's story of survival. Latt has made it clear that War of the Worlds is about a man and his journey. The DVD was released on June 28, one day before Spielberg's film. The success of the movie was praised for its revisualization into a horror film, being described as "the most horrifying version of all". It was also praised for its faithfulness to the novel. NOTE: Actually, according to our reader Thomas, it was the Pendragon Pictures version that was praised for being "extremely faithful". The Asylum's version differs greatly. 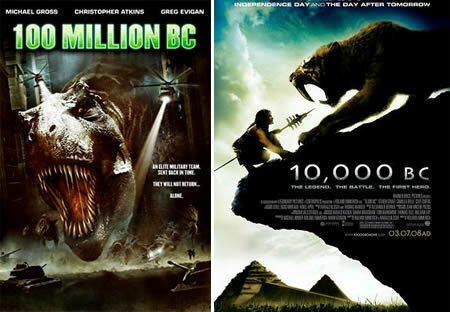 100 Million BC (released as Jurassic Commando in France) is a 2008 action films that has a title similar to both 10,000 B.C. and One Million B.C., but its plot bears a closer resemblance to both Jurassic Park and Carnosaur. The film, to a certain degree, also bears some similarity to events depicted in the 1984 film The Philadelphia Experiment. Thanks to our reader Colin for the idea and the info!